It was the turn of the century and times were changing. When the Reed ancestor had left London he had entered a country in which seeds of independence were beginning to germinate. The 1857 Indian rebellion had resulted in British Government takeover of administration from the East India Company. A managed but gradual parliamentary system was formed which supported landed gentry and the princes. It was an exercise hoped to preserve continuing rulership of the Raj with the connivance of an increasingly prosperous and educated Indian elite. But that was not enough! Gandhi appeared on the scene to articulate the cry of the masses for a return to ancient times of glory in which Indians were masters of their own future in a revitalized Bharat Mata. Reed generations had lived through much of this change. They were disinterested in politics of this new wave of nationalism. Relative peace and harmony had been their experience and apart from occasional intra-cultural skirmishes they’d not experienced any form of dissatisfaction with their position in the cultural affairs of their society. Indians and Sahibs had lived in peaceful co-existence in their area for as long as they could remember. But with changing moods the quest for independence brought a slow but sure dividing of those who supported the Raj and those disadvantaged. 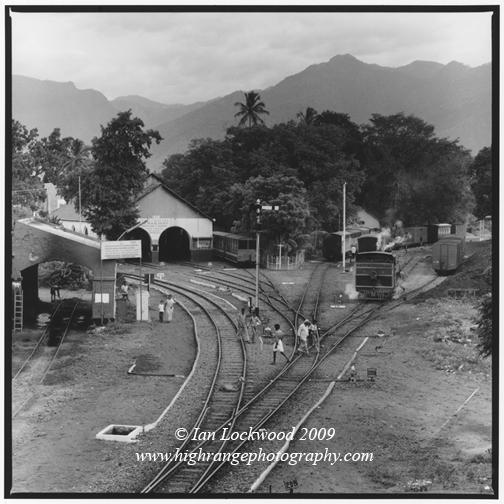 By the time Humphrey’s father had retired it was with great difficulty he was able to obtain permission for his son to succeed him as the one in charge of rail operations in that district below the mountain. Pressure on the Raj was being applied by increasingly radicalized Indian members of the parliamentary system, supported by educated elite. Champions of the masses were appearing in various parts of the country to mobilize grass roots support. The Rajas looked on this movement with alarm. They saw a threat to their own power in that movement. So it was not surprising Humphrey found it increasingly difficult to manage rail line maintenance workers who’d previously been willing to follow orders without question for the pittance the railways paid. Now services were being disrupted in the non-cooperation movement and Humphrey came under fire from rail administrators. He was ordered to be stricter in his district administration to avoid further disruption of schedules. The British prided themselves on their railways running like clockwork and they reacted sharply to any interruption. Geeta found herself catapulted into the position of go-between workmen and her husband as the non-cooperation movement grew and flourished. Politics had caught up with the Reeds. Then in rapid succession Humphrey lost father and mother. In sympathy with this loss there was relative peace in the community for some time. Humphrey was not unpopular, but being one of the Sahibs he was considered part of the Raj and its system of oppression. To add to his grief his beloved wife Geeta who’d been his strength through it all died at the time of her second childbirth. Both mother and child passed away in spite of best efforts of the village midwife. Gopal Das arrived and took over management of the funeral when he saw Humphrey was too grief stricken to handle the cultural expectations of the community. His son-in-law was deeply grateful. That shared experience restored the fractured relationship between Gopal Das and the Reeds for a time. Before returning to his own station management position Gopal Das talked with Humphrey about the need for someone to mother the young child Felicity Rani his first born. He suggested the young child return with his family to be brought up under their supervision. Humphrey could see their motivation was well meaning and expressed gratitude for their suggestion. However this was his child and he could not bear the thought of being separated from her. She was his last link with Geeta. Gopal Das understood this and after consulting with his family came back with a suggestion he could make a marriage arrangement with his cousin’s daughter who in her mid-teens was of marriageable age. The idea of another marriage to such a young person just after Geeta’s death was more than Humphrey could handle. He expressed his gratitude for their concern again, but firmly stated he was not ready for such a move. So it was arranged for Mrs Gopal Das to remain until Humphrey had worked his way through grief and could deal with his daughter’s future. She proved to be a valuable asset as Humphrey dealt with an increasingly strident railway worker force. But eventually her own family responsibilities dictated she return home, though not before she imported the relative her husband had suggested for marriage and replaced some servants with ones who would keep her informed. Humphrey who was still dealing with grief along with his heavy work responsibilities was unaware of the implications of these changes. He was happy though that his daughter was still with him, and she’d be properly supervised and protected while he was at work. This was an era in which a smouldering dissatisfaction was coming into focus. In India there were different cultures. Indian Hindus, Moslems and Christians in the sub-continent had somehow worked together in uncomfortable acceptance under the strict rulership of various rulers of the past and later the British. This was beginning to unravel. Caught up in that was the position of domiciled Europeans who identified as Indian and the offspring of European and Indian marriages. They were inclusively referred to as Anglo-Indians. While not fully accepted in European society as a rule the British found them useful in management levels directly interfacing with the Indian population. The Anglo-Indians understood the culture of Indian people and the Raj so were valuable in providing communication between the two disparate cultures. As the non-cooperation movement grew and spread this group became a convenient target of the Indian population who lacked power to deal with the might of the Raj. They needed this equally powerless group to vent their frustrations on knowing they could not retaliate. And as the non-cooperation movement spread the British Government targeted Anglo Indians for not being strong enough to control this ground swell for which they themselves were increasingly unable to manage. Humphrey by virtue of the fact he’d “gone native” in the eyes of the Raj became increasingly vulnerable. This situation played into the hands of Gopal Das who in his position as local rail management had honed his political skills. The British in casting about for ways to manage and control their “Jewel in the Crown” began looking for Indians who were prepared to play the game their way in return for advancement. They noted the relative stability in Gopal Das assigned district and pulled him into regional rail administration in the hope he could control instability in other regions. While he paid lip service to the Sahibs he made prudent moves to extend his influence. Establishing secret membership in Indian National Congress he was able to slowly replace Anglo-Indians with Indians of his own choosing, obligating them and establishing his growing power base. From his membership in Indian National Congress the future of the Raj and supporters of its authority became very clear. The British had military power and technology at their disposal, but systems they’d introduced, education they’d encouraged, rail and highway networks, and communications they’d built facilitated spread of ideas the Indian National Congress favoured. The Raj had created conditions for their own demise and henceforth their control over an exploding population would weaken until they had to eventually concede and leave. That was still ahead in Gopal Das estimation, but he and the Indian National Congress had patience and confidence on their side. As Quit India movement gained momentum management of far flung districts of the nation became almost untenable for Europeans. Gopal Das placed his protection over Humphrey as long as he could. Clamour from emerging Indian bureaucrats to move Indians into provincial responsibilities with the support of a Raj desperately looking for friends to influence rather than use their political and military might became the norm. This was more than Gopal Das could handle and his own credibility with the Indian National Congress was at stake so he made the journey to talk with his son-in-law. Humphrey had dealt with his grief by this time. It was now five years since Geeta had died and Felicity Rani was into her early teens now. She was his pride and joy and he noted her budding womanhood. She was fair skinned with her mother’s beauty and finely chiselled Eurasian features. The two of them were an inseparable pair when Humphrey was not at work. In round about terms Gopal Das discussed the coming political storm, and with his transplant Indian mind Humphrey understood implications for his own future. Henceforth he could expect to be supervised by Indians who would rather he were not there and would probably be looking for ways to ease him out to be replaced by their own kind. Then World War II intervened. The British were under attack and could expect little sympathy from an increasingly hostile people so reacted with tight controls. Some of those who’d been most active in the Quit India movement went over to the enemy for protection and others went underground to watch and see who would win in this war. Humphrey found pressure on his management temporarily on hold. But subsequent to that war pressure on British to grant independence increased, and Britain was now too weak to resist that pressure. Seeing the writing on the wall, all those Europeans and Anglo-Indians who could afford to do so migrated to countries which had been relatively untouched by the war, with Canada and Australia receiving a steady stream of these political refugees. Gopal Das begged Humphrey to follow in their footsteps rather than be subjected to the humiliation placed on those who remained after independence and sought to continue work there. Humphrey was committed to remaining in India though and patiently waited to see how things would turn out. Felicity Rani had been aware of her womanhood for some time now. An Indian girl would be married at her age she mused and for some time she’d been sizing up Tomas Smith. He was older than she at 18 and he 24 but it was obvious he intended to stay in the country and had been smart enough to build relationships which would hopefully save him when the inevitable independence took place. He was Anglo Indian, but that was an inaccurate description of him as his ancestry included a French connection from the old French enclave of Pondicherry, and there was British and Bengali blood in him too. Thomas had been employed at regional rail headquarters and would frequently visit their district on inspections. It was not long before Humphrey noticed the mutual attraction and realized with a start his daughter was no longer a child. When Thomas proposed marriage Humphrey reluctantly agreed and they were married with all the pomp and splendour of a European wedding. Humphrey realized he was alone now. The girl Mrs Gopal Das had installed in their home long ago had tired of waiting for Humphrey to respond to her obvious encouragement and left when she had an opportunity to get married. He was left with only servants who’d been with him for several years and a realization his future work prospects were limited if any. Tom and Felicity Rani were located in Madras. He sank into depression doing his work mechanically, then one morning servants taking him his morning chai to wake him found him dead in bed. The Reed name had ceased to exist in India at last. Yes I often wonder why people hit “like” on blogs that are sad. I suppose they are liking the story rather than the content. lol. Best regards! I love your writing Ian and you never shy away from telling it how it was…your style of writing weaves history from an empathetic and easily relatable viewpoint. Thank you. It’s nice to get that kind of feedback Jane. I enjoyed this history lesson woven around a fictional story. It is well done. The conclusion of this chapter took me by surprise, but then the historical tableau is equally full of surprises. Thank you for bringing it to us. I’m so happy you enjoyed this chapter. I’ve had writers block for some time while I dealt with health issues and have been putting up stories written some time ago. This series is my first venture back into writing for a while and it was hard to get my mind back into the discipline required to write a series. Such good writing Ian. The political and interpersonal is so well done. I didn’t expect that end to the chapter, made me catch my breath. It was fun putting it together. Having travelled those areas I had a picture in mind as the story suggested itself to me.